Apple's wireless carrier partners were surprised to learn of Apple's new iOS 5 messaging feature during Monday's WWDC keynote, according to a new report. iOS 5, which is due out this fall, features a new messaging service, allowing iPad and iPod touch users to "join the conversation." 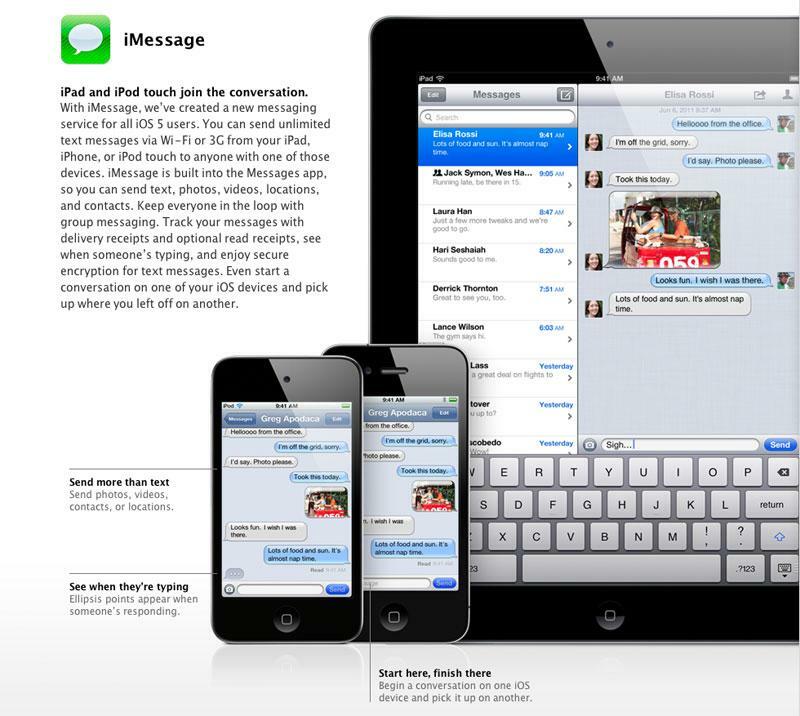 iMessage allows unlimited text messages via Wi-Fi or 3G from one mobile iOS device to another. Built right into the Messages app, users can send text, photos, videos, locations and contacts. iMessage will also support delivery receipts and option read receipts, along with secure encryption for text messages. Conversations can also be tracked on multiple devices with the same owner. John Gruber of Daring Fireball reports that "a well-informed little birdie" told him that "Apples phone carrier partners around the world found out about iMessages when we did: during todays keynote." Gruber's industry sources have been reliable in the past. The news of Apple's iMessage may have been quite the shock for wireless providers, which bring in substantial revenue from SMS plans. Gruber himself noted that he plans to cancel his SMS plan as soon as iMessage is available. The feature will also compete against a number of iOS apps that offer SMS-like functionality. iMessage has drawn comparisons to Research in Motion's proprietary BlackBerry Messaging service. Though BBM initially served as a draw to the platform, RIM has struggled as consumers have increasingly chosen Apple's iPhone and Google Android in recent years. AT&T chief Ralph de la Vega said last week that AT&T customers have been "choosing other products rather than traditional BlackBerries." Apple has at times been at odds with the wireless carriers over new features in the iPhone. Late last year, European carriers threatened to discontinue subsidies for the iPhone after reports emerged that Apple was developing an embedded SIM card that would allow customers to shop for wireless service directly from the Apple store. A subsequent report suggested that Apple had backed down from its plans because of carrier opposition. The France Telecom CEO said last month that Apple had agreed on a compromise to use a smaller card instead of an e-SIM. In addition to iMessage, iOS 5 packs 200 new user features and 1,500 new APIs, including an all-new Notification Center, a PC-free design and Newsstand, a new way to purchase and organize newspaper and magazine subscriptions. The free software update will be available for iPhone 4, iPhone 3GS, iPad 2, iPad, iPod touch (fourth generation) and iPod touch (third generation) this fall, though some features may not be available on all products.